Through my social media conversations, I’m hearing that Sales VP’s and CFO’s alike are now intently focused on improving the customer experience to reduce churn. Because we’re in a highly competitive market where the focus has been on improving margins and reducing churn, carriers and forwarders are looking for every opportunity to recover the $250M in air and over $1B in ocean revenue leakage that happens eachyear. Inaccurate billing is one of the most common causes of damaged relationships and churn, and I’ve learned that the global and regional networks are now developing a plan to help manage these inaccuracies. Because they’re also aware that overcharges and claims nearly guarantee a proportional amount of under-billing losses, they are taking measures to protect their customers, their sales team, and their bottom line. Some have assembled a task force, some have purchased SaaS software, and some are building IT and software solutions in-house. However, more IT alone cannot stop revenue leakage. All of this happens before the data becomes visible to IT, which means that software can only be reactive and is entirely unable to address the root cause. Globally speaking, only 29% of software implementations are successful. 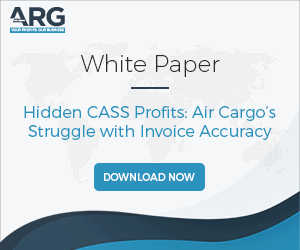 On page twelve of this Air Cargo Survey, Accenture reported how cargo and revenue management software has created only mixed results and that just 21% of executives indicate they can maximize profitability. While Accenture is seeing a high degree of automation in booking and routing processes and enhanced visibility into capacity utilization, carriers are struggling to realize further improvements especially in areas of pricing integrity. As you can see, there is a huge amount of risk and exposure baked right in to every order we carry, so it’s no surprise that one of the top 25 global air carriers experienced a 125.18% increase in under-billings within a year after implementing an advanced revenue accounting system. The airline also had large spikes in overcharges which led to customer disruption. Unfortunately, these problems led the airline to part ways with its President. Software can provide additional measures and controls for internal data but if IT were enough to resolve the issue, the problem would no longer exist. But because companies are seeing IT as full solutions, these issues exist across the board and permeate all industries, as similar problems have occurred with a misguided focus on IT for healthcare in addition to challenges attempting to use IT as the solution for government. These ‘hidden’ areas of impact that are unreachable by IT must be addressed if we expect to capture lost profits and reduce the churn and turnover stemming from invoice inaccuracies. In reflection, the industry leaders who have turned to big data and sourced specialized cargo audit expertise have typically seen at least a 20% reduction of under-billings within year 1. The right solution that goes beyond software has also helped them to benefit from a faster quote-to-cash process, a faster cash conversion cycle, and reduced soft costs by receiving fewer disputes and more on-time payments. If I can help you to check your metrics and confirm how many millions are at risk in your network each year, let’s connect.